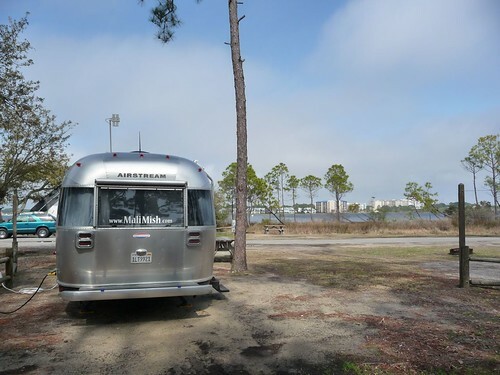 Mali Mish – Day 37: The Florida Panhandle – St. Andrews State Park. Our first night in Florida was spent in the parking lot of a Wal-Mart in Navarre, FL. We had to back track about 15 miles since the first one we went to in the middle of the night did not allow overnight parking. No big deal. 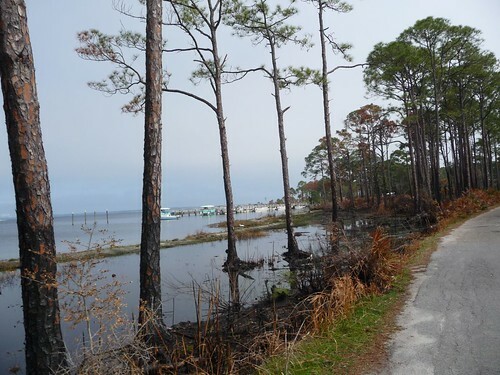 We expected to spend a lot of time here in Florida and Navarre is as good of a place to start as any. It rained on us just a little bit last night and continued to lightly sprinkle in the morning. Our usual routine at a Wal-Mart parking lot in the morning is to patronize the in-store fast food joint for a quick breakfast and maybe load up on whatever gear we might need. 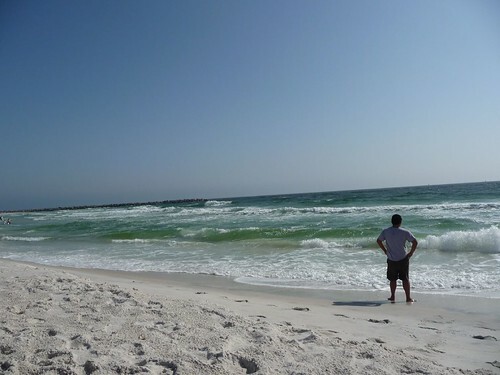 The Florida panhandle is said to have a the nicest beaches in the world. 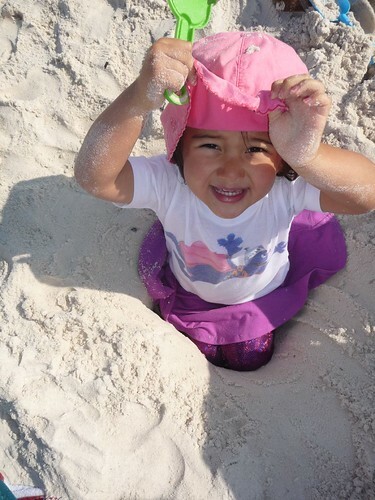 They are blessed with the whitest and finest quartz sand that is almost as fine as the powdered sugar-like sand in New Mexico when we visited White Sands National Monument about a month ago. Being that it was a Friday and we had no reservations anywhere, we were pretty much out of luck as far as a weekend campsite is concerned. We called all of the State Parks within 100 miles of us and they were all booked full for the weekend. Being near the start of Spring Break surely did not help us at all. 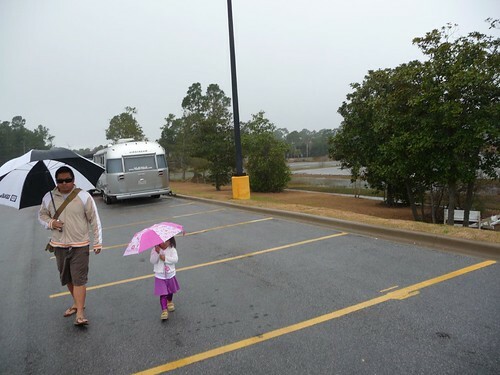 Luckily, we found out that St. Andrews State Park in Panama City, FL keep first-come-first-serve spaces for people just like us. From some of the research we have done online, it is also one of the more sought after campgrounds in the panhandle. It was about a hour drive to the east so we got on the road in a hurry to make sure we were going to get a spot there. 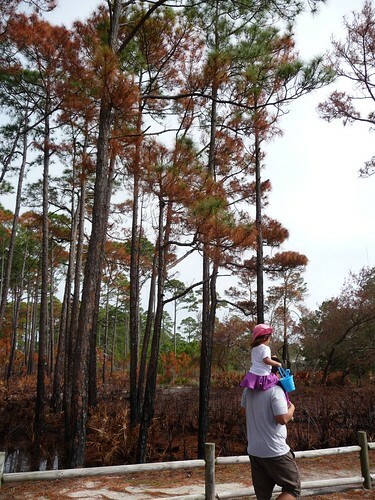 Being our first Florida State Park, we didn’t really know what to expect. We have heard a lot of nice things about them but seeing one first hand was going to be the true test. And they did not disappoint. Our site was beautiful. The weather this time of year is just perfect. A little bit of humidity from the recent rain made us finally feel like we are on vacation. 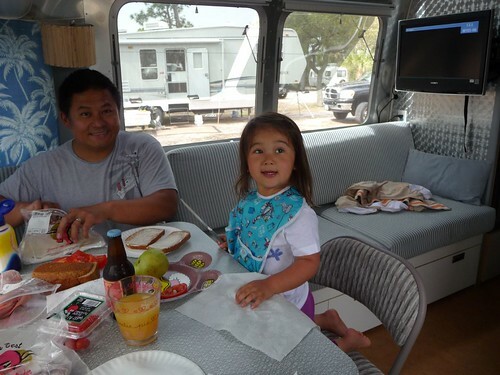 We settled into the Airstream and made ourselves some well-deserved sandwiches for finally making it to Florida. This is our site and the view from it. It’s not waterfront but how can you beat it for a Friday afternoon just before Spring Break and no reservations? Being that it is a first-come-first-serve site, we could not reserve it for more than the night we arrived on. If we wanted to stay additional nights, we will have to go back to the check-in office at 9am sharp or someone else could theoretically take it from us. I actually like that they have this policy and wished all campgrounds did. 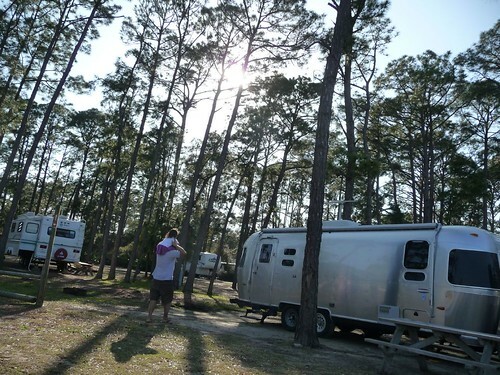 A lot of campgrounds in desirable locales either are constantly booked or are only first-come-first-serve. This method they have retains flexibility for both types of travelers. With bellies full of sandwiches, we were ready to do some exploring. 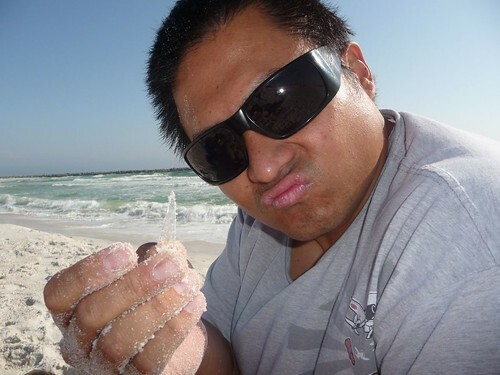 We needed to see these white quartz sand beaches. We figured since the water is right here, the beach must be just around the corner. 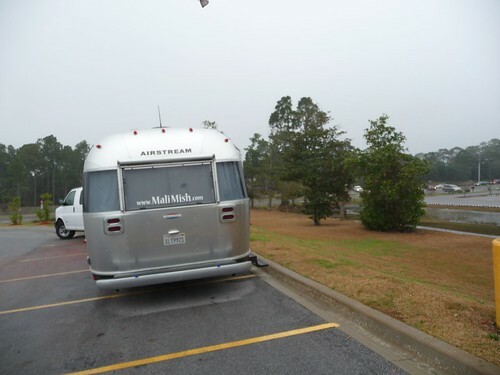 Since I didn’t bother to unhitch the Airstream our only option was to hoof ourselves over there. Turns out it was a bit of a walk. 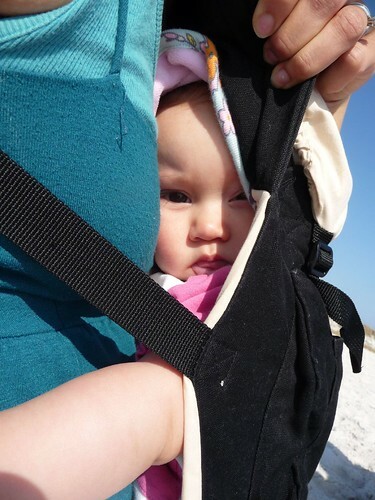 Maybe not as far as it seemed to me but since I forgot to bring a stroller for Ava, having to carry her the whole way made it feel like we walked over a mile to get there. Even with her on my shoulders, walking a mile with a 35 lb toddler on you is not an easy task. Thankfully the beautiful scenery was there to distract me from the neck and back pain. Look who was full of energy once we finally got to the beach! The beaches were indeed as white and soft as they said they were. As we got closer to the coast and out of the tree lined campground, we could tell that it was blowing pretty good at the beach. On a windy day like this back at home, there is no way anyone would be out in the water surfing these white caps. In Florida however, there are probably half a dozen surfers out. Being the Gulf Coast, it probably doesn’t get anything but wind swell and this is probably considered a decent day of surf. Mila came prepared in her carrier nicely bundled up and well protected from the sun and wind. 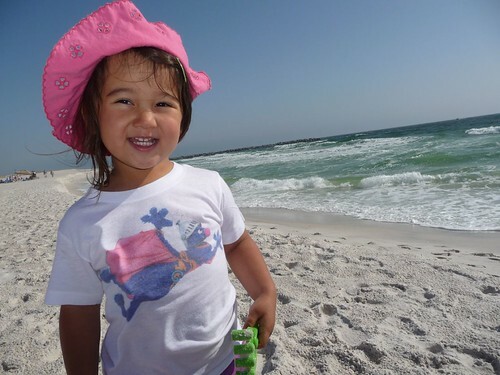 Ava on the other hand just loves being at the beach. Being confined in a trailer most days on our trip, she is usually bouncing off of the walls and we have to try real hard to keep her entertained. 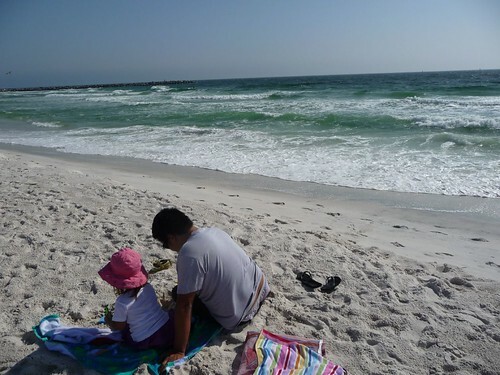 The beach however, is like heaven to her. All she needs it a bucket and a shovel and she could be content digging and shoveling for hours on end. She could careless about the wind as long as she is at the beach with her sand toys. Her hat and Super Grover on the other hand are not real pleased with the gusty conditions. 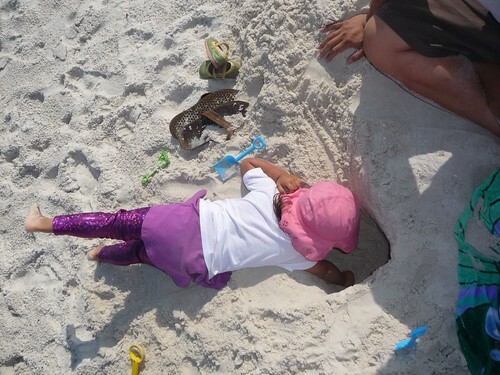 We started digging a hole to find pirate treasure but I think she is really trying to dig a hole to China. 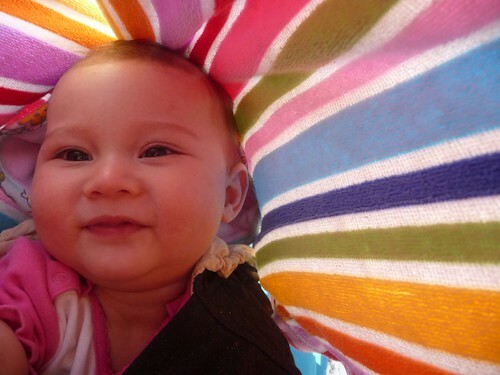 Mila found a safe haven under our beach towels and got to enjoy an afternoon at the beach outside of the carrier. 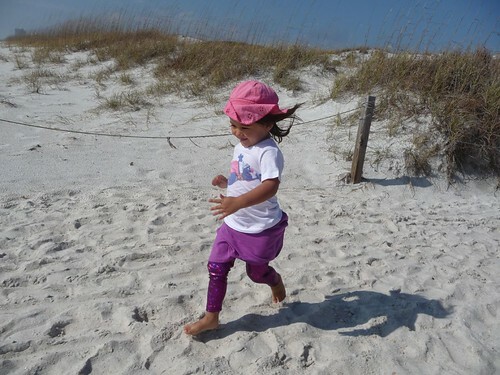 What better place to wear your shiny purple pants than at the pristine white sand beaches of the Florida panhandle? Now you see them. Even though you are not allowed to bring glass bottles to the beach and the signs at the parking lot clearly says so, it didn’t stop some people and I did find a sharp piece of glass right in the sand next to where we were playing. Luckily, none of us stepped in any but it is a little scary to think that one misstep will get one of these suckers right up your foot. Time to get back to the campsite. 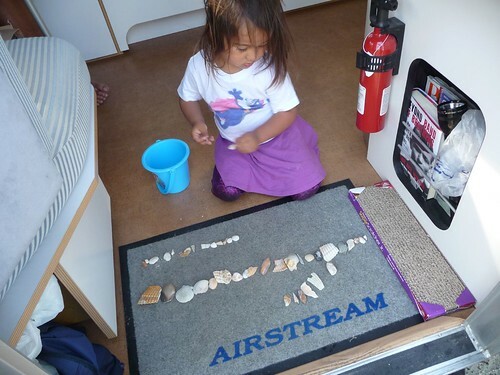 With a bucket full of pirate treasure, Ava got a ride back to the Airstream on my shoulders. Time to count the loot!